What’s the best cool season grass? If you live in the northern two-thirds of the country, cool season grass is your best turf option. Cool season grasses thrive when the temperature is between 60 and 75 degrees. You’ve got your choice of four common varieties: Kentucky bluegrass, tall fescue, fine fescue and ryegrass. Each has its benefits. Keep in mind that the best cool season grass is the one that is right for your specific conditions and lifestyle. Who needs cool season grass? If you live in the northern two thirds of the country, cool season grass is right for you. The four common varieties of cool season grasses each have pros and cons. Find out which variety fits your specific conditions and lifestyle. Install the cool season grass variety that is right for you! Kentucky bluegrass: Sometimes called the “king of lawn grasses”, Kentucky bluegrass provides you with a finely textured, deep green lawn. Pros: Kentucky bluegrass is a great, general purpose turf that forms a dense cover. It spreads and recovers easily because it grows by rhizomes. These rhizomes extend sideways from the main plant, forming a new plant. Kentucky bluegrass adapts well to most conditions, and grows in light shade as well as full sun. Cons: Older varieties are more susceptible to leaf spot and other diseases, so be careful to choose a newer bluegrass blend that is more resistant to diseases and pests. When exposed to prolonged hot, dry weather, bluegrass will go dormant and its color will fade. Tall fescue: This is a durable, bunch-type grass that produces a dark green, finely textured lawn. Pros: This is a good choice for lawns that get a lot of sunshine. It requires slightly less fertilizer and water than some other cool season grasses. Tall fescue’s deep root system enables it to tolerate heat and drought. Cons: Tall fescue is prone to thinning. Because it grows in clumps, the sod is weaker and recovers relatively slowly from injury. Be careful when mowing. Tall fescue does not tolerate a close mowing height; 1.5 – 3 inches is recommended. Fine fescue: A finely textured grass, fine fescue is primarily used in mixes such as with perennial ryegrass and bluegrass. It produces a dense, upright, dark green turf. There are both bunch-type and rhizome varieties. Pros: Fine fescue grows well in acidic soils, as well as in dry and shady conditions. It is the most drought- and shade-tolerant of cool season grasses. Considered low-maintenance, it doesn’t require much fertilizer. Cons: Fine fescue needs well-drained soil and does not stand up well to heat or heavy wear. Perennial ryegrass: Bright green and medium texture, perennial ryegrass grows in place (it’s non-spreading) and produces a dense turf. Pros: It grows rapidly from seed and wears well. Ryegrass can withstand a lot, including foot traffic and compacted soils. Newer varieties are also more resistant to diseases and pests. Plus, it helps protect slower-growing grass species. Cons: Perennial ryegrass works best when included in a mixture. It is not as shade-tolerant as some other cool season grasses. Older varieties don’t hold up well against cold and drought. Still not sure which is the best cool season grass for your home and lifestyle? Harmony Turfgrass simplifies your choices. 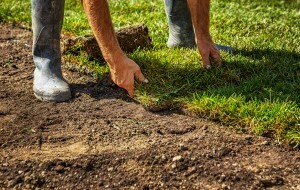 Our premium quality sod is customized to your region, and categorized by use. And we continually field test our sod varieties on our farms to ensure you have the best available lawn grass no matter where you live.